You must make reservations at least 5 minutes in advance of the time at MARBL Toronto. New to the Toronto area. MARBL! Sunday Brunch menu is lovely. The French toast with fresh berries and cheese fabulous. The food had no taste. The owner tried to fix the situation but it was still so bland. I'm a foodie and I dine out regularly. Wouldn't dine here again. Nice decor and very loud music. Misogynistic Service and mediocre food at best. Male server solely regarded my boyfriend the entire night, as if his opinion is the only valid one. Worst squid ever, could not even chew it. Not worth 250$ at all. When I e-mailed them about my experience, the manager responded with a weird a comment about how she knows that surely my complaint is not "in search of a refund"; as if to suggest that i'm solely complaining in search of a refund. I never asked for a refund, as good service and an adequate response would have been to offer immediately. There were no proper recovery services offered during dinner when the food was in fact terrible. I have never complained about my dining experience in a way of an e-mail and now a follow-up review, but this was an exceptionally horrible experience. The way they handled my private complaint is a further reflection of how MARBL is run. Offering to have us back with a complementary experience...why would I want to come back? We really do regret that we had to tear you away from folding table napkins and talking with your friend, but the dinner we ordered was ready, and, well, it was cold. Forced and cold. Cold and not really all that special. The restaurant is very elegant and upbeat. Service and food was excellent. I would highly recommend this place. Had the braised lamb shank. Absolutely amazing, meat falls off the bone. Cooked to perfection. I enjoyed the food at marbl. The apps and our entrees were amazing. I really enjoyed every part of the food. Unfortunately I was given unethusiastic service. When you spend 300$ you expect a little attention to detail. Waited long to order drinks and waited long to place my food order. The kitchen team did a great job but FOH needs to work on serving tables especially when it’s empty and there are no guest in the restaurant. I would not recommend this place to anyone. Poor food and service. Loved the food and service. Would definitely go back and recommend. Waiter spilled my water and my cocktail, didn’t apologize for either. Waited over an hour and a half between the mediocre appetizer and the mediocre main. Very expensive for what you’re getting. Service was awesome and food was great! The club downstairs is also really nice. I’ve been here twice. I love the place great vibe . My second experience wasn’t the greatest. The food was ok had to send two dishes back. The manager didn’t even come to us to ask us if their was anything they can get us . Poor management. They need to work on their customer service and food service. The place wasn’t even busy so no excuse. In order for me to return I would only go for drinks. But then again their are other places on king street I would prefer. Service was fantastic, however the food came out luke warm, but as it was on un-warmed plates, the food became cold quite quickly. After informing restaurant management, no steps were taken to address the issue. This is unfortunate as the experience was quite good until then. Loved the atmosphere and food but it was was too loud to even have a conversation. Overall a good experience. Service started a little rough but was smooth. Food was flavourful but our mains arrived cold, which was disappointing considering the restaurant wasn’t even busy. Spent about $200 for two people which is on the high end. We loved the appetizers but were disappointed with the entrees (pork and pasta) that we chose. The revitalized space is nice. Not as dark and more open than previous establishment. We liked the space. The food was good: b-sprouts, smoked octopus 👌🏼, ceasar, striploin, frites and catch of the day. All done well and all good. The ambience at 8-9:30 had a bit of buzz but after 9:30 it was pretty packed. When she came back with my sisters drink she asked us if we wanted to order food just as our food order came to the table and she said “oh” & then left. Oh & if you haven’t noticed in this long drawn out comment that I haven’t mentioned she apologized, well it’s because she never did. The stars are not for her but for everyone else on the ball. Thanks to Peter and the rest of the team for saving the evening. Had a reservation and they made us wait in the basement bar and did not have a table for us at the upper bar we had reserved for. We ended up joining a friends table instead due to lack of seating. - not cool! Not a good first impression at all. We went downstairs to go to the washroom, and when we came back, they had seated a couple at our table who had their drinks and everything already served. Meanwhile our waiter arrived with our food and looked around in confusion to what was going on. And we were awkwardly standing there for ten minutes while they sorted this out. But hey, I’m sure the free dessert (which was OK at best), more than made up for that embarrassment. The food was good though, so at least they have that going for them. I doubt I’ll be going back. Amazing evening! Food was incredible! The staff is very friendly and knowledgeable about the menu and cocktails and wines. After dinner we went downstairs to the champagne room which was fun too!! The chairs were so uncomfortable my back hurt when we left. Expensive for a fine-but-not-rock-my-world dinner. Waiter was hovering around the whole evening and when we went to order a bottle of wine, he told us they were out of anything under $300 - which clearly wasn't true because the manager came over and proceeded to give us a bottle of what we asked for once we complained!!!!! 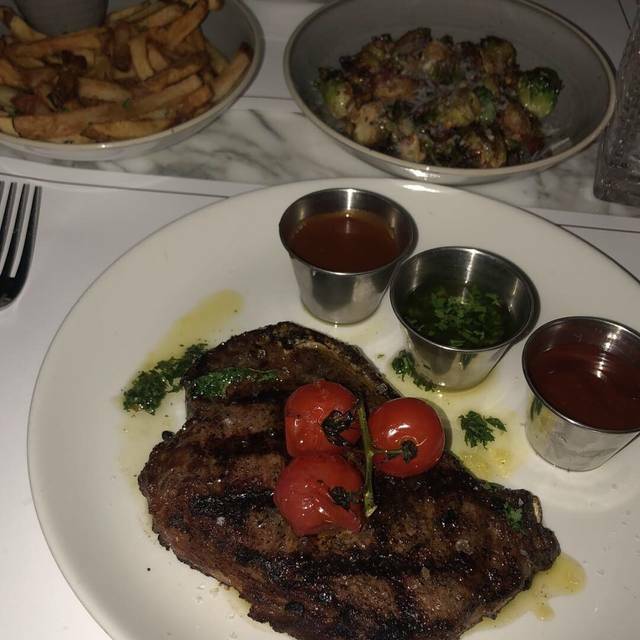 The food was not what they said in their menu they supposed to serve 48 oz steak which in reality it was 20 oz of meat and 28 oz bone . Also their appetizers was way over price and low quality. We have to wait 1 hour and a half for our food to come. MARBL is trying to strike a delicate balance that few Toronto restaurants are able to achieve. It aspires to be a hip place to "see and be seen", while at the same time catering to those who enjoy good food and drink and are prepared to pay dearly for both. Unfortunately, MARBL has a long way to go before it can achieve that balance. It certainly succeeds on the first count (hip and cool) - but when we were there on a busy Saturday night, it fell far short of the mark on the gourmet dining experience we were expecting. Fortunately for MARBL, the demographic it appears to be most concerned about does not seem too concerned about (a) dishes being served lukewarm after waiting far too long under heat lamps, or (b) Caesar salad being served with enough dressing for 3 times the serving size, or other major shortcomings - they are there to have a good time before hitting the clubs afterward, and they are clearly enjoying themselves. As for the rest of us (for whom the food and drink does matter first and foremost), MARBL has a long way to go to get where it aspires to be. Fortunately the ownership and management does seem concerned about that, so maybe if they work hard at it they can get there - but as they say on Shark Tank, "I'm out". The service was pretty slow all night. The food was average food but dressed up nicely. I enjoyed the ambiance and cocktails. I’d maybe go back for drinks but nothing more. One of my friends complained but only her bill was compensated. A bit disappointing since there were 5 other people who had the same experience. Great location. This place has a lot of potential. Unfortunately there was only 1 desert on the menu. Incomplete spirits menu, the server had the list written on a piece of paper. Server must move faster on the customers drink refills. The main course came immediately after the appetizers which was a bit too fast. The chefs were kind to make an exception and add black truffles to my main course which was a delight. Will return over time when the restaurant is more settled in but overall it’s a nice place. The managers are very attentive and welcoming along with the hostesses. Ambiance is great. Stylish furniture and set up. Love that you can see the kitchen live in action. Fantastic service and great food! The food was decent. It was a bit loud, but a good vibe, flow could be better.